The artist and department manager Yrjö Semeri studied at the Viipuri Friends of Art Drawing School and was later employed by Otto Meurman’s architectural studio in Viipuri. 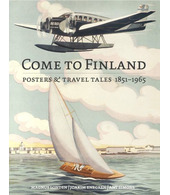 In 1932, Semeri moved to Helsinki and got a job at the Tilgmann publishing house. He advanced to become manager of his department and became a true and faithful servant of the company, remaining there until he retired. Yrjö Semeri drew a number of posters. In a competition for native home district posters in the 1920s he received first prize for a poster of Viipuri. During his long career at Tilgmann’s, Semeri worked on several demanding typographical tasks, such as ex-libris designs, labels and cards. He also drew postcards.